Just like Aleks Krotoski in her BBC Radio4 series The Digital Human, I’ve been fascinated with Serendipity for a good chunk of my life. I don’t remember the first time I ever heard the word, but I do remember the first time it’s meaning was explained to me. It was in the early 90’s, in an bar on an island in South East Asia. I’d initially planned to take a year out from my studies, but that single year stretched into ten, and like many I was traipsing the well grooved routes carved out by International backpackers, armed with their Lonely Planet guide books. Quite often you’d be surrounded by strangers and yet find a friend. Someone you’d met in a hostel or train station weeks, months and a thousand miles before. You felt that these ‘chance’ encounters continents apart were happening randomly, and I was initially in awe at what appeared to be the magic of the universe. Of course when you all read the same guide book, you all move the same way. It’s an endless conveyor belt of skint backpackers shifting from one cheap hostel to the next. It was only when I binned the guide books that I felt I was experimenting with chance. The ‘happy accidents’ came thick and fast. People, places, work, unbelievable opportunities, all became intertwined with one another and my new favorite phrase… Serendipity. Once I grasped the word and it’s meaning, I felt I was treading a fine line between diving headlong into new experiences, embracing these happy accidents and attempting to avoid self fulfilling prophecies. Like some people in their belief that you make your own luck, I seriously thought serendipitous moments could be hunted. Serendipity was not a metaphysical construct, but a skill. A skill dependent on your ability to use your embodied ideas and experiences to see the opportunities caught up in seemingly chance discoveries. You need to first be in a position to have a chance encounters. On top of this you need to see the opportunity’s within those encounters at the same time as recognizing the value of these connections taking place. The more I said yes, the more serendipitous situations I found myself in. It was all down to perspective and how I saw the world around me. When you travel, time slows down. I don’t just mean as in Time Dilation when two identical clocks have a time discrepancy as one slows as it’s flown round the world. I mean in the experiential sense. I had a theory that routine would have your brain collate similar experiences together. In the normal work-eat-sleep day to day of an individual, five breakfasts in the same house, five commutes on the same roads, five lunches at the same desk would blur into one memory. The weeks become days, the months become weeks. Time would speed up and life pass you by. Traveling, moving, punctuated the passage of time with new scenes, new sensations, new faces and you were always seeing the world with fresh eyes, as the normal filters didn’t have time to form. Serendipity grew all around. Ripe for the picking. Years later I hope I’ve at least kept hold of a few of these beliefs. One working day is rarely the same as another, I alternate my cereals, my t-shirts and for some reason the arm I wear my watch. It catches me out. It breaks a routine. My social network was initially built around people who’d share similar interests to me. It’s now these patterns that I don’t see that bother me. The filter bubbles delivering me parts of the web it thinks I’d like to see based on past behavior. This algorithmic meddling can happen unnoticed. I’m blessed with online friends who are pretty random in nature. Spontaneous and inquisitive, many with passions different to my own. Quite often, I’ll follow or add to a list someone with a totally different outlook. Even someone I may not agree with. This I hope will assist in avoiding the creation of more filter bubbles segregating me from the more unexpected online discoveries. I try not to surf the internet like Google wants me to. Although Twitter assists me in delivering news from the minds of nearly 4000 people. I still like to stumble upon, rather than ‘Stumbleupon‘ stuff. When you visit my blog, try to Ignore the search bar on the right and instead click the serendipity button below it. I’m not saying you’re going to stumble into some life changing content. But it’s certainly a journey into a little unknown. “No” I said. “I want a Serendipity Button”. 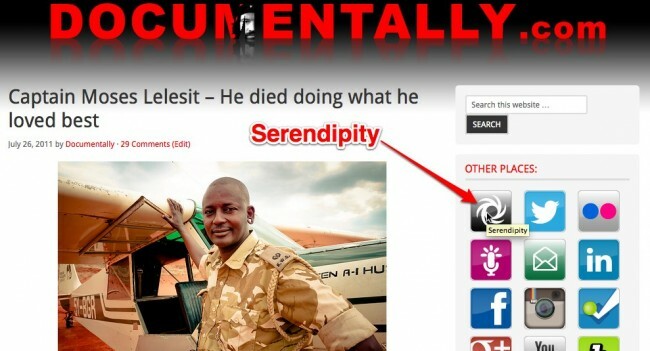 A serendipity button should be a magnet to the inquisitive. After all, they are the ones who totally understand the value in looking for one thing, but finding another. Elegant concept, and potentially powerful with people like me who test reason to destruction and want to see the evidence, yet also trust intuition and are curious about the mystery of life. I would be really interested in being part of such a pilot, and offering feedback on what difference the serendiptity button made to my social media experience.